Dear Simplicity Patterns . . . Your new website is garbage. It has been months since it was “updated” and yet it has not improved one bit from the disaster that it initially was. The search option is heinous. This is incredibly frustrating. McCalls recently did an upgrade as well, but that one works just fine. What the heck?! How do you expect to sell any patterns if no one can find them? I am, however, enjoying some of these new designs. 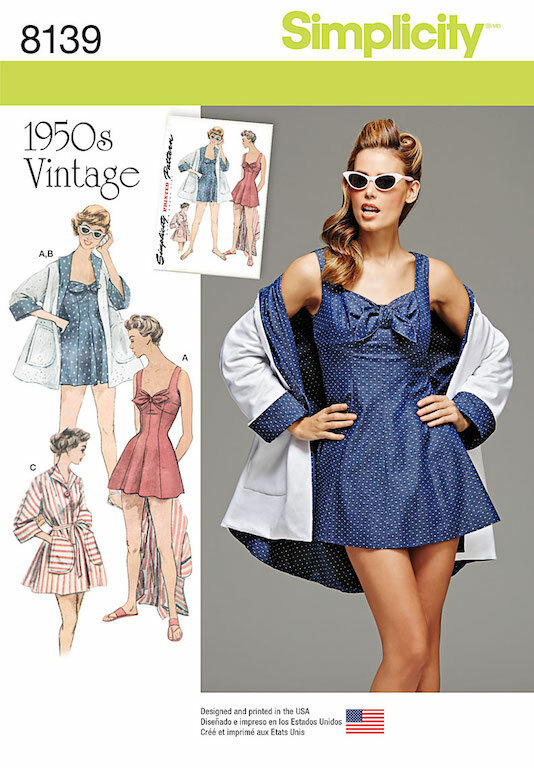 And while I cannot image needing a swimsuit in the future (and I think this is probably a look best suited for lounging around the pool, and not actually getting in the water), this vintage reproduction is wonderful! 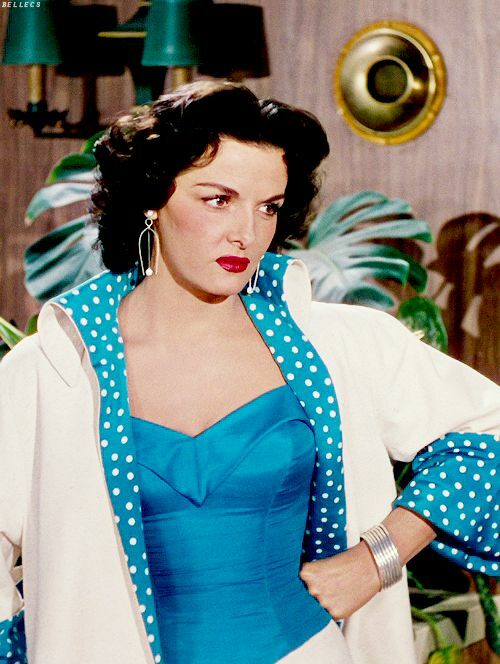 It feels very Jane Russell in Gentlemen Prefer Blondes. The jacket, certainly, needs to get in my closet immediately. And maybe with a significant hem alteration, I could make the dress work for me. It looks like there are bloomers under the swim dress, but how are they attached? There is no waist seam, so does that mean that layer extends all the way to the underbust, or are they separate? I am definitely going to check this out the next time I am at JoAnns. And I would be very curious to see the original vintage instructions on this . . . does anyone have a copy? My other big complaint is that the catalogs seem to be released in dribs and drabs. The only reason I am aware of new designs is because of the independent pattern designers. 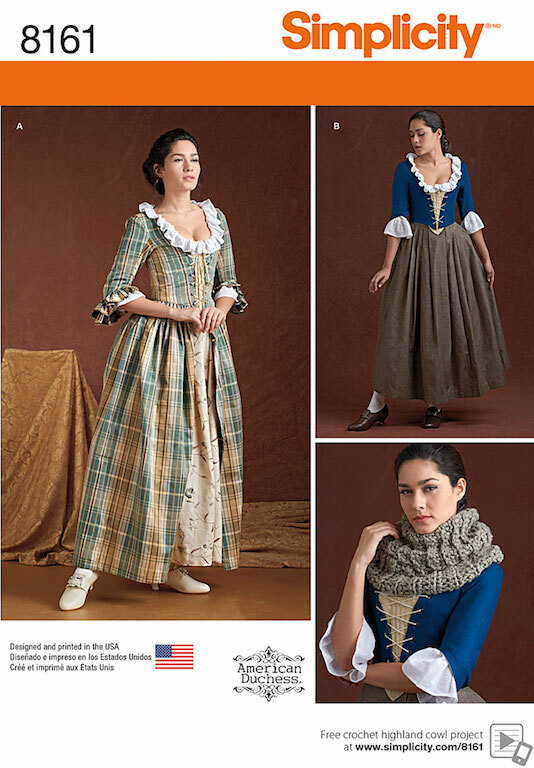 For instance, there were hints on the American Duchess instagram account and blog that there would be Outlander themed patterns in the next Simplicity catalog which is the only reason why I bothered looking at simplicity.com. And the first few time I did, I got very frustrated because I could not find them. But I am so very thrilled for Lauren! It also sounds like there will be quite a bit of information on her blog about making these patterns a bit more authentic than the limitations of a contemporary paper pattern would allow - I can't wait to learn something new! I am not familiar with the Outlander books or the television series, but I have certainly seen images of the costumes. This Bar Suit look-alike is so gorgeous!! I think I need to find an excuse to start making costumes again - that, or figure out a way to wear panniers and bum rolls in everyday life! 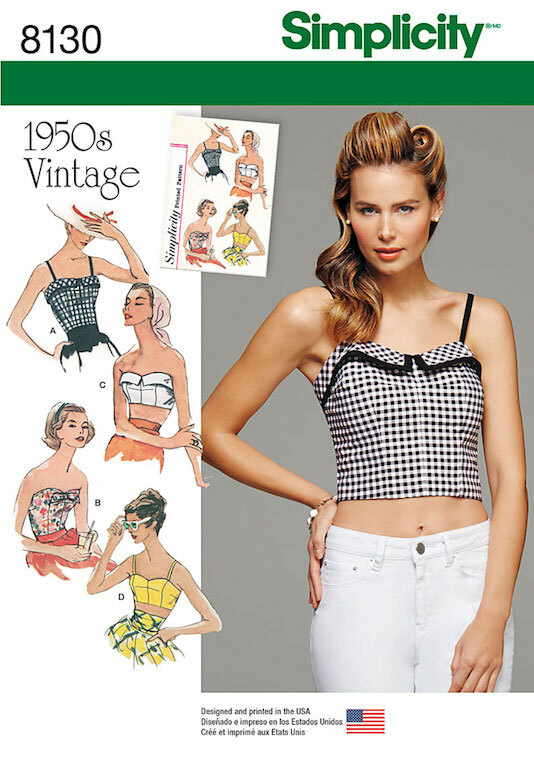 This little bustier top has a very similar feel to Simplicity 1426, which I have made. The pattern is very cute and it may have to come home with me. I can see a lot of possibilities. This dress has great bones. I do love a nice princess seamed skirt! And I am not sure about the above-the-bust seam on this dress, but it might be a fun experiment. Is this flattering, or a horrible idea - it probably depends a lot on body type, but I would be afraid that the line would make it look like the dress is ill-fitting through the bust. Proportionally, the shorter length looks best to me, which may mean that I skip this one. McCalls has also released their latest Summer catalog. I wish they would stop having so many different catalogs (Early Spring, Sping, Early Summer, Summer), just put out four of them, but make them more interesting, please! I am not finding a single design that interests me, even after looking at the line drawings. I guess the Archive Collection is gone. Boo-hoo. I guess I will just have to find something I like in my stash of patterns to keep me busy . . . which should not be all that difficult! I am so with you on the Simplicity website--it is horrible! 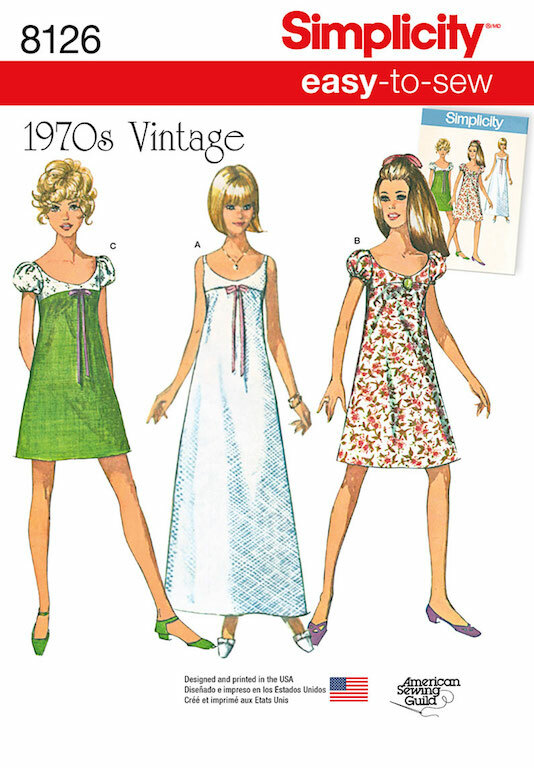 And they have some wonderful Burda patterns that I cannot get to because of the way it is organized. If someone planned to sabotage this company, they couldn't have done a better job. Cute picks on the patterns you did find! Agree, agree, agree! I actually just purchased the "swimsuit" that I will not be using as a swimsuit. The lining is to be knit and mirrors the shoulder straps and bodice but is like a one-piece swim suit into the bottoms. Everything is joined at the shoulder and necklines and stitched down at the zip. I hope that helps! Thank you for the info! That makes sense. I fondly remember when there were new patterns every month. I do not wish for less because we already have that. I do not understand these negative posts about the big 4 pattern companies. Don't get me wrong . . . I am very thankful that the Big 4 exist and I can get my hands on cheap patterns. The main problem I have is that they continually produce the same, boring, and incredibly easy designs and I am looking for a challenge. I would be happier if they took a bit more time to finesse some interesting and/or challenging designs and did not feel the need to constantly release "new" stuff which is really just rehashing the same thing over and over again with different cover art. you are so right, the Simplicity website is terrible! the strange thing is that their organization and search functions were actually quite good before. You could choose a brand and then drill down to various categories such as dresses, pants etc. Now it is a jumbled mess. I end up using the Pattern Review website to look at Simplicity patterns. Either way - I am likely to buy fewer Simplicity patterns. As for the McCalls release it was mostly unoriginal things, they looked like copies of other existing patterns to me, so nothing at all of interest. I would love to see you make an Outlander outfit! I loved the old search function! I actually found some Burda patterns I liked because of that option. And I think you are right about Pattern Review - it seems like the best way to see what is new with Simplicity. Off Topic but when are we going to see you modeling your gorgeous floral symphony dress? I'm dying to see it on you! When I get through all the photos! I still have a bunch of in-progress pictures to go through as well . . . it should be sooner rather than later. I just get tired of looking at my face after a while, so that slows me down! Really digging the Outlander-style dress though. I feel like I need to start watching that show just for the costumes. I have completely given up on the horrible Simplicity website. You'd think they were trying to reduce their sales on purpose! However, my workaround is to go to Pattern Review and look at Patterns under the Shop tab. You can choose new patterns or just go to the Simplicity link and choose by catalog. I don't like how the patterns are categorized, but they're very viewable and easy to check out. I now keep my wishlist there and have completely dumped what used to be on the Simplicity site. And even better, Pattern Review gets the new patterns up long before the Simplicity site does—at least they always have in the past and I assume it to still be true. Pattern Review is where I found these images! And I am going to have to remember to go there for updates. It is so ridiculous that other websites and companies have the new designs available before Simplicity does! Love the first pattern, but why oh why don't they choose a model with a figure which will suit it, there is loads of excess on the bust here! Hi Laura Mae! I agree that the pattern websites are so challenging to deal with. I usually don't even bother anymore so I appreciate you finding something worthwhile. Thank you. Given your love of costumes and all you really need to check out Outlander for the costumes alone. Between the small bits of 1940s clothing and then the 18th century gowns I think you would love it. The silver linen wedding gown with the 40 bazillion pleats in season 1 is stunning The whole Dior meets 18th century thing in season 2 is to die for. I don't look at the websites - I have YOU. Which I am thankful for. The above the bust seam works for A-cup me (I make a sundress similar to DoS Everyday "Given a Chance" where that bust shaping has wandered up there) but certainly not my more generously endowed clients. All costumes are now apocalyptic in theme. Le sigh. Le boring work. Mostly distressing thrift shop clothes. This is what I get for complaining about too many corsets. I own the original swimsuit pattern. I converted it to a PDF file last summer, because it was very popular with the vintage sewing community, and everyone wanted it. The suit itself is very simple, the lining is the suit, the exterior fabric forms the dress. I'm sure the reproduction pattern lacks many of the details that the original contains. I should buy the new version and compare.